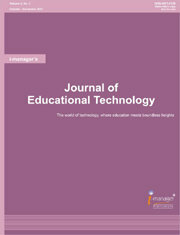 i-manager’s Journal of Educational Technology has been satiating the reader’s quest to sense the role of technology in education effectively, and puts forth the insight of international authors in education technology and bestows a global outlook to the readers. It renders the most modern trends and researches in Higher education to stay current with the new trends and thus to structure a vital and valuable academia. Prime motto of the Journal is to induce the commitment of educators in giving unparalleled education by presenting quality and innovative ideas of educational researches and practitioners worldwide. The Journal follows a double blind peer-review process. The submitted articles / research papers are reviewed by Professors / Educators in Education / Educational Technology fields. Academicians, practitioners and post-graduate students in the field of Educational Technology, University Educational Bodies, Researchers, Consultants and leading Corporate etc.